Reclosable Anti Static Poly Bags, 4 mil. Home > Poly Bags and Tubes > Poly Bags - Reclosable Anti Static Poly Bags > Reclosable Anti Static Poly Bags, 4 mil. Faraday cage protection. Translucent for easy identification. 3/8 mil spec seal. Amine free interior. 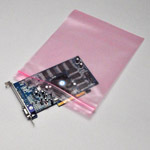 Display All Reclosable Anti Static Poly Bags, 4 mil.